CBA is starting a new tradition, and it’s going to be salty – the first annual CBA Pirate Cruise! 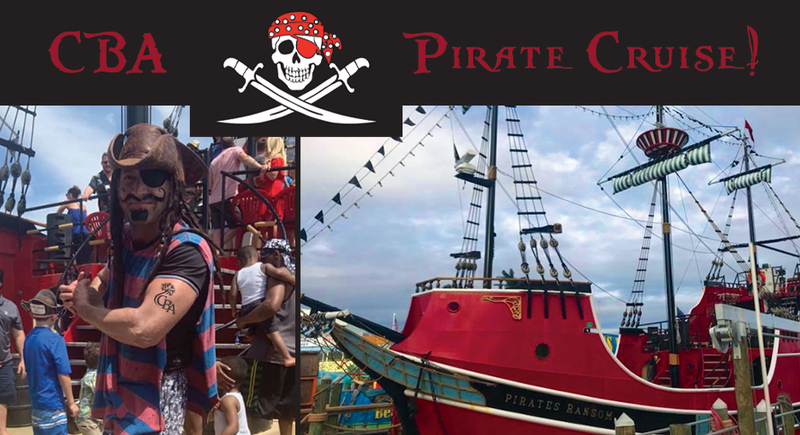 For those who haven’t been aboard this authentic ship, it’s great fun for kids and adults alike. We will cruise around in search of dolphins and treasure while soaking up the sea air and sunshine on our two-hour voyage. Face painting, stories from the deep, cannons, and water guns to be enjoyed by all. Check out their website HERE. Right now we’re scheduled to set sail May 5th in the morning, but we need a headcount. CBA will be taking care of a portion of the cost, and once we have an RSVP list, we can give participants more information. So, if you think you want to join in on the adventure, please RSVP to Captain Sam at hutloan@aol.com as soon as possible. Hope to see you there, Matey! There is a Senate Committee voting on short-term rentals (SB 824) tomorrow. Since we know this has been a hot issue for many of you, we wanted to make sure you were aware of the details. At the bottom of this email there is contact information for the City office, if you wish to call or email, to voice concerns or ask questions. • Remove the grandfather clause currently protecting those cities who were regulating short-term rentals (STRs) prior to 2011. • Preempt to the FL Department of Business and Professional Regulation (DBPR) the regulation of vacation rentals. • Require that any ordinances (noise, parking, trash, etc. ), must apply to all residential properties, regardless of how the property is being used. • Restrict local governments from imposing occupancy limits on rental properties, or requiring inspections or licensing of rentals (specific to STRs). • The vacation rental industry has exploded in the last five years. This shows that local government regulation of these properties hasn’t stifled the market in any way. • As the industry has grown, DBPR has done nothing to ensure compliance with current state licensing requirements. DBPR is overworked and understaffed. DBPR could not handle the administrative burden created by vacation rentals after local governments were preempted in 2011 and is even less equipped to do so now. • A solution is needed that balances the property rights of all. Issues with unruly behavior, parking and public safety are destroying the residential character of traditional neighborhoods. Residents suﬀer while corporations profit. • This is a local zoning issue. Commercial activity in residential neighborhoods is regulated for good reason: to protect residents and ensure adequate infrastructure is in place. • Removing the grandfather provision negatively impacts the property rights of Floridians who purchased their property with the reasonable expectation that they would be living around other long-term residents. An investor would be able to purchase the property next door and turn it into a party house in areas where short-term rentals are currently prohibited. • The ripple eﬀect of unregulated short-term rentals is exacerbating the aﬀordable housing crisis. Homes are being converted into mini-hotels, thereby reducing long-term rental stock available in communities and causing a workforce housing shortage. 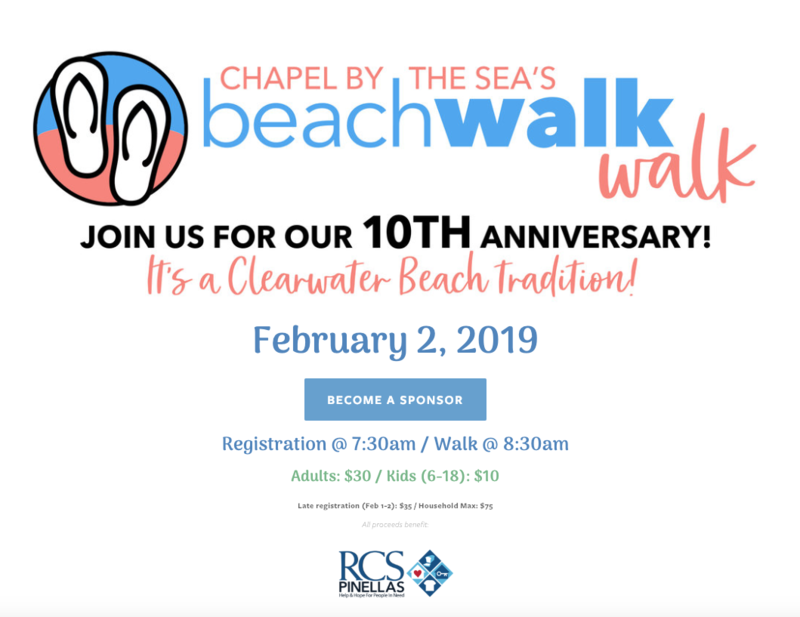 Annual Beachwalk / Walk This Saturday! Or you can register, in person, on the day of the fundraiser. Don’t miss out on this wonderful event. Non-perishable food donations for RCS are encouraged at both the Chapel and Palm Pavilion. Saturday February 2, 2019. Start time 8:30am at the Palm Pavilion. Registration begins at 7:30am at the Palm Pavilion. All participants will receive a Beachwalk/Walk t-shirt. A hearty breakfast for all registered participants and sponsors at the Chapel, following the walk. The Florida Wildlife Commission would like to hear from the locals regarding land-based shark fishing. They have provided a link to leave comments on this subject. Please give your thoughts and feedback before November 21st so that they can be included in the December meeting. This topic is highly controversial, particularly along our shoreline. Please click the link and let them know how you feel. 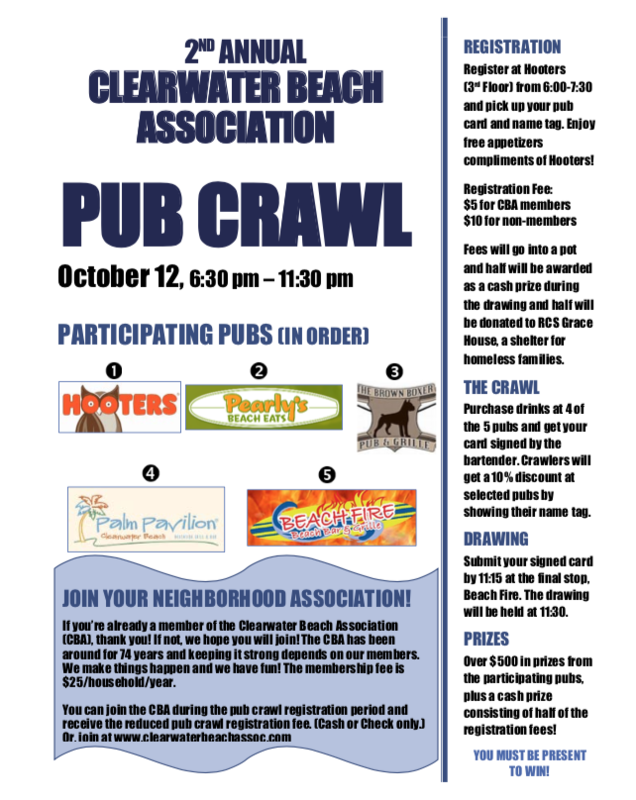 Annual CBA Pub Crawl This Friday! The International Coastal Cleanup Happening This Saturday! 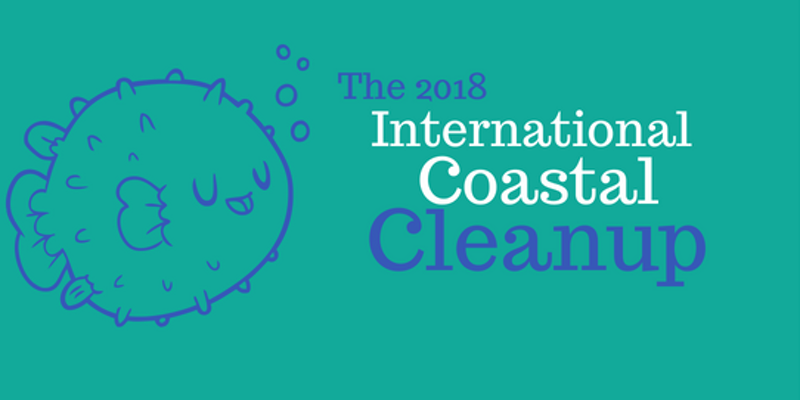 The International Coastal Cleanup is happening on Clearwater Beach this Saturday, the 6th from 9:30am – 12:00pm! Please join us as we partner with the Clearwater Solid Waste and Recycling Facility, the Protect Clearwater Beach Task Force, and the Clearwater Marine Aquarium to tackle the issue of marine debris on our coastlines. The millions of tons of trash that enter the ocean each year entangle wildlife, pollute beaches and consume taxpayer money. We need your help to put a stop to it! Location: Volunteers will meet at the public access point at Parking Lot 36. Directions: When arriving at Clearwater Beach, take a right off the roundabout and onto Mandalay Ave. Continue on Mandalay until you reach Bay Esplanade Ave and make a left into Parking Lot 36. NEXT MEETING: 9/4 AT 6:30!